It goes without saying that the two most significant things of a wedding are the bride’s dress and the wedding cake. The moment you step onto the aisle in your elegant wedding dress, all eyes will be fixed on you. Your gown will set the tone of the whole celebration along with the reception. Such is the effect of the wedding dress. There are only a handful of once-in-a-lifetime experiences that you get to control. Walking down the aisle in your wedding gown is one of the most significant of them. There are many brides who are armed with the knowledge of dress shopping. This includes choosing a dress which mirrors your own personality and makes you feel confident and proud. It is quite surprising that there are many brides all over the world who tend to overlook the most critical aspect of the wedding dress. The tailoring of your gown can make or break the final look. Wearing a poorly fitted wedding dress that is a bit loose here and too tight there can ruin your look. 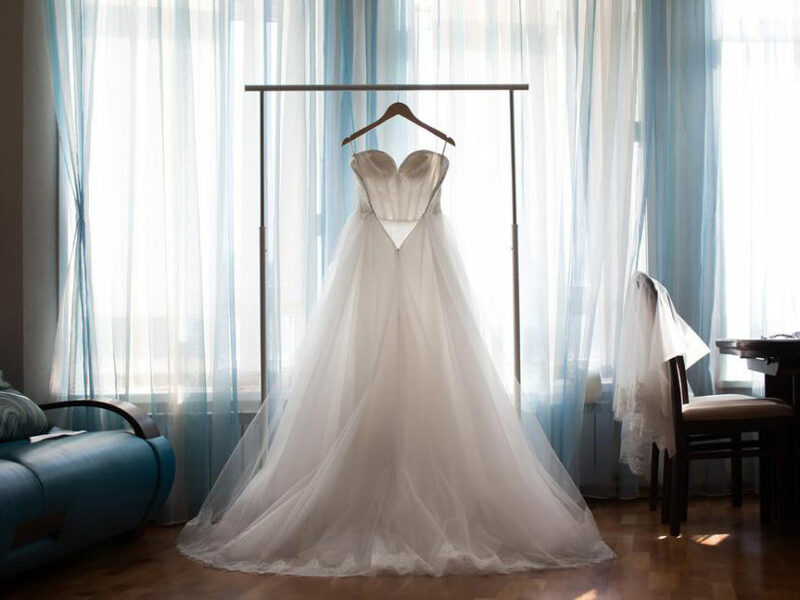 Getting your gown tailored to perfection is an important aspect of getting your gown right. Do not overlook it. You may have to pay some extra dollars but it is better than wearing something which will turn into a fiasco. Here are some of the most significant aspects you must keep in mind while getting your wedding dress tailored. Most brides develop a tendency of going on a vigorous diet weeks before the ceremony. They choose a dress much smaller than their present fit hoping that they will be able to lose the extra pounds. This is absolutely wrong. Choose a dress that fits you on the day you walk into the bridal salon. The dress can be tailored to fit your unique shape. You do not want to feel pressurized to fitting into a small wedding dress. The stress of organizing your wedding is enough. The cut, as well as the style of the gown, should decide how the waistline must be tailored. If you want something that will fit around your torso, ensure that all the buttons, zipper and embellishments are laying flat. You also do not want any unflattering sags or gaps around the waistline. The dress should fit around the waistline in a way that it doesn’t cinch your body too tight neither should it hang loose. Most brides get it wrong when it comes to the bust line of their wedding dress. You should remember that just because you can zip up or button it up, doesn’t mean that it is the right size for you. The most effective and perhaps the most absurd way to test if the wedding dress is the right size is to hold your hands up and jump up and down several times. Check to see if the dress has moved and you need to pull it up. If this is the case, then it will need adjustments. A wedding dress is tailored well if it fits snugly in all the areas it is supposed to. You will be dancing and sitting down a lot. The perfect dress will accommodate for all this and more.